Shopping with baby can be challenging, particularly in those early weeks and months when you’re still getting used to life as a new parent. 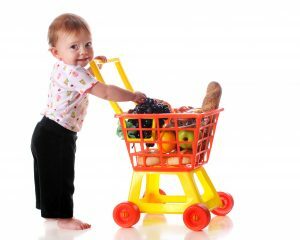 If you grocery shop alone, juggling baby, groceries and shopping cart can be especially daunting. In this post, we’ll outline the different ways to safely shop with your little one. Many parents mistakenly believe they can place their infant carrier on top of the shopping cart by the handle; however, this practice is dangerous and can lead to falls. In fact, falls from shopping carts are the number one cause of head injuries in young children. If you choose to place your infant carrier in the shopping cart, the only safe place is in the cart’s basket, where you typically store your groceries. Unfortunately, this will leave less room for your milk and eggs, but it’s the only option if your store doesn’t offer shopping carts with Safe-Dock. If your local store doesn’t offer Safe-Dock and you need to save your cart’s basket for groceries, you might consider babywearing. This is a safe way to keep baby close to you and it frees up your basket for groceries; however, many moms find it uncomfortable and many babies don’t like being confined in a carrier. The easiest way to grocery shop with an infant in tow is to use a cart equipped with Safe-Dock, the first universal car seat docking station for shopping carts. Safe-Dock securely contains most infant carriers sold in the United States and allows you to easily transition your baby from the car to the cart, without disturbing her. Moreover, it leaves the entire basket free for groceries, so you’re able to cross everything off your shopping list. To determine if your local store offers Safe-Dock, visit our home page and enter your zip code. If your preferred store location doesn’t currently have Safe-Dock, we invite you to request the product through our site and we’ll share your request with your store manager. Happy shopping!